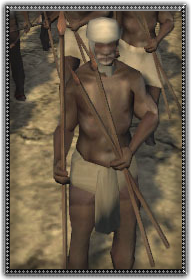 Compared to the Makurians or the Beja, the Afari have a much more recent arrival into the politics of the region, their ancestors having arrived to settle in the highlands of Ethiopia some time before 1000 AD. At first raising livestock, they began a gradual transition into a nomadic lifestyle. As a result, they've come to be involved in many conflicts with neighboring tribes and peoples.